When I am at a loss for meal ideas, I turn to some old stand-bys… Meatless Monday, Taco Tuesday, Fish Friday … if I am really stuck in the middle of the week, that generally means pizza (gluten free and home made, of course!). This week, I was stuck for a new idea on Tuesday so I immediately started thinking about ways that I could make Taco Tuesday a little bit more exciting. I thawed some grass-fed hamburger meat in the fridge all day while I plotted exactly how I could avoid making a special trip to the grocery store. Thankfully, I had bought 2 avocados on Sunday and they were sitting patiently on the counter. I bought the avocados with the intention of making guacamole on Father’s Day but I never got around to it. Faced with these two avocados on my counter, I still didn’t really feel like making guacamole. As dinner approached and the littles were getting restless, I began preparing the avocado, gently cutting the avocado in the middle and twisting the two sides apart. I took a large spoon and separated the tough skin from the delicate green flesh. 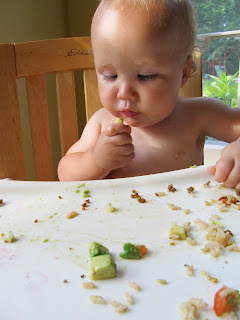 I started chopping the avocado, eating a piece and giving bites to my baby here and there, waiting for some inspiration. As I looked into the bowl and saw the beautiful pile of chopped avocado get bigger and bigger, I realized that all I would have to do was serve this as its own chopped salad to accompany our simple tacos and cilantro brown rice. Easy! Delicious! I continued chopping the avocado and also added one thick slice of local Vidalia onion, finely chopped. I then sliced a large tomato, removed the seeds, and chopped that into our deconstructed guacamole. I sprinkled the salad with a little bit of sea salt and drizzled the tiniest bit of olive oil over the top. That’s it! No mashing, no mixing. I lightly tossed the ingredients with a fork to combine them and served it immediately. The simple avocado salad was a huge hit with the kids and my husband. Because I used a sweet vidalia onion, I could even give this to the baby and not worry about giving him too much spice – as you can see, he loved it!